If I were to ask any other traveler what makes a great trip they’d say it’s the people you meet on the road. Can I get an amen?! Sometimes you meet them over a bottle of wine, sometimes crawling pub to pub, sometimes by accident. Try or not, it happens. 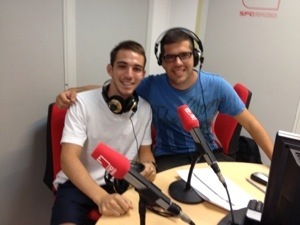 In Sevilla it started at a Couchsurfing event and ended on Sevilla Football Club’s radio show. My first night in Sevilla I was alone. While nursing the migraine hammering my brain and seconds away from phoning mommy I finally fell asleep. And so my Sevilla experience began with my sanity holding on to the promise of a Couchsurfing meeting the following night. “Where are you from?” , “Denmark”, “Marseille”, “Toronto”, “Here.” Just like that, we were new friends. I had purchased tickets for the upcoming football game and learned that the Spaniard across from me in our conversation worked for the city’s very own club. Getting a Spaniard to talk about soccer isn’t a hard thing to do. Getting them to shut up about soccer is nearly impossible. Juan LOVES his club. He practically dribbled out of the womb and onto the pitch already wearing Sevilla’s jersey. His first words were definitely gol (goal). The man loves his team and he wants to share that love with anyone open to it. And being a seriously casual traveler, I’m game for almost anything. “I’ll give you a tour of the stadium if you want. Meet me tomorrow, 6 o’clock, under the big mosaic. Don’t forget.” How could I forget?! The words Free and Stadium are enough to get me drooling like a dog. I walked home earlier than usual that night just to make sure I mapped my way home before my sense of direction washed away. The next day I caught a cab to meet Juan outside the stadium Ramón Sánchez Pizjuan. Paying for a cab is much much more than paying to get from A to B. It’s a saving grace from the weather here because taxis have air conditioning, unlike my room. Juan took a picture of me in front of his teams mosaic on the wall of the stadium and then he started the tour. Minutes turned into an hour and an hour wasn’t enough time to take in the view. Imagining the empty stadium filled with fanatics chanting the traditional songs of their team teased me. Juan told me that his stadium has a reputation for the best fans. All game, all 90 minutes, I can expect to hear them sing. “It is incredible. You will love it,” he said. “Only three minutes until my work starts, would you like to see the radio?” How could I say no? Three, two, pause, red light. “Hola y buenas tardes…” The two talked amongst themselves for a while previewing the highlights of the show for the night and other talk show things formalities. After about seven or ten or fifteen minutes later I recognized my cue. To be honest I don’t know how long I sat there thinking of prepared responses for questions I had not been asked yet. I had to make sure to use the correct verb tenses. But, I also didn’t want to forget the right prepositions and nouns. Or, what if I used the right verb but butchered the pronunciation. What if I butcher all the pronunciations and get all the grammar right? I’d much rather get the grammar wrong and sound like a spaniard then talk with an american accent. Oh crap he said my name! I hope he talks slow, here we go. “Que d-i-j-i-s-t-e?” (What did you say?) I exaggeratedly responded even slower than Juan. The co-hosts broke into laughter and I felt a little more relaxed. This will be fun I reminded myself. Where did you travel so far? Where are you going next? Tell us about Couchsurfing. What do you think about Sevilla? You’re going to the game Sunday, are you excited? I wish I could have just answered sí, sí, sí for every answer he shot my way. But that’s not what radio is all about and I was determined to rock my 15 minutes of spanish fame. And I did! Four semesters of spanish, two mexican girlfriends, one mexican best friend and a trip to spain later and I can say a lot in spanish — mucho. Or is it muy? All in all, Sevilla was awesome and I’m sad to say goodbye to such great people. Juan, Mike, Delphy, Charlotte, thanks for everything. I will miss you all. Travel safely! This entry was posted in Travel and tagged Radio, Sevilla, SevillaFC, Spain, travel, Writing. Bookmark the permalink.